We're still in a travelling mood so I thought we'd make a stop in Prussia and meet a king who abandoned his plans for political neutrality and found his might tested by the Napoleonic armies. Born to Frederick William II of Prussia and Frederika Louisa of Hesse-Darmstadt, the destiny of Frederick William III was never in doubt. As a boy, Frederick and his brother, Prince Heinrich, were sent to live and study under Count Hans von Blumenthal at his home in Paretz, where they passed many happy childhood days and undertook the obligatory Grand Tour. Frederick was a studious and serious young man who greatly enjoyed his time in Paretz, so much so that he would one day buy the von Blumenthal estate, returning there many times with his own family. Frederick's military career began in adolescence and by the age of twenty, he was already a Colonel, experiencing his first taste of battle just a couple of years later. As he had enjoyed a peaceful boyhood, so too was he blessed with a happy and fruitful marriage to Luise of Mecklenburg-Strelitz, who enjoyed great popularity with the people of Prussia. The politically aware and ambitious Luise would prove one of Frederick's strongest influences in matter of foreign policy, her advice and opinions having far-reaching consequences for her adopted homeland. Frederick William became King of Prussia on 16 November 1797. A sober young man, becoming king did nothing to alter Frederick; rather, he set about trying to change the throne he had inherited. At odds with what he saw as the low moral and political standards of the court, he made immediate attempts at reform. Whilst court expenses were slashed and long-serving ministers who had grown seemingly irremovable and increasingly irrelevant were dismissed, the new king proved somewhat less successful when it came to matters of foreign policy. Despite his own efforts to remain neutral in the ongoing Napoleonic Wars, Frederick allowed himself to be persuaded into battle by the wishes of his wife and her preferred ministers. This change of direction was to prove fatal as the Prussian army was crushed at Jena-Auerstädt, on 14th October 1806, with William and Luise at its head. The powerful country was left humiliated, its military reputation in tatters and as Napoleon occupied Berlin, the royal family fled for East Prussia and the protection of Emperor Alexander I of Russia. Luise was crushed by the defeat and the pregnant queen sought a personal audience with Napoleon, at which she begged him not to be too harsh on Prussia; though he was charmed by her, he would make no concessions to the country he had defeated. Stripped of vast swathes of territory and subject to enormous financial punishment, Frederick accepted the punishment on behalf of his country. Queen Luise had other ideas and championed a number of minsters in their efforts to implement reforms in Prussia to ensure they would never face such humiliation again. When the Queen died amid national mourning in 1810, reforms continued and in 1813, Frederick somewhat reluctantly agreed to the Kalisz Union, forging an alliance with Russia agains Napoleon. The Prussian king and his armies would spend two years travelling Europe, these diplomatic efforts finally rewarded with territorial gains at the Congress of Vienna. Frederick William III's efforts at reform were far narrower than his advisors or first wife would have liked, betraying his essentially traditional character. Initial plans for a constitution were to come to nothing and whilst he was keen to implement administrative reform, he stopped short of accepting changes that might have an impact on his own powers. He was conspicuously overshadowed in his political dealings not only with France and Russia, but with talented ministers from Prussia itself, including Baron von Stein, a particular favourite of the queen. 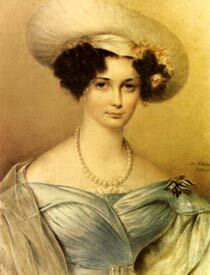 Frederick married again in 1824 though his second wife, Countess Auguste von Harrach, never enjoyed the political influence nor public affection of Luise. Upon his death in 1840 his son, Frederick William IV, took the throne of Prussia, once more starting along the road to reform. You know what, when you look at history, and the way nations went to war over territory etc, it makes you realse that the EU, for all its faults, has prevented any european wars since the end of WW2. We need to think very carefully before we all bugger off and become nation states again! I cite Russia as an example of what happens when states decide to breakaway! He was known to be an unpleasant man in general and his wife was far too good for him.